Cavcon Construction is a full service, merit shop, general contractor serving Pittsburgh and the tri-state area, providing construction management, design build, and traditional bid services. Located in Greensburg, Pennsylvania for more than 80 years our commercial construction heritage translates into superior quality and performance for our clients. Cavcon is also in the unique position to provide total turn key clinical medical facilities. We can provide feasibility, design, construction, and licensure services for these complex projects. Please view these facilities in the Medical Design Build portion of our portfolio. • Summit Ridge Plaza construction continues to progress. When completed, the new retail shopping plaza will feature 13,250 square feet of space. • CAVCON named Construction Manager by Adelphoi to oversee campus Improvements to include construction of a new Welcome Center and Fitness Facility. • Penske Lease Trucking- expansion of a new warehouse and office space. • Sweden Valley Manor, an (HFC) owned long term care and rehabilitation facility, located in Coudersport PA - interior renovations with an addition. • Laurel Highlands Telecommunications Building - construction of a new HQ in Donegel. • Warren Manor, an HFC owned long term care facility - addition and interior renovations completed. 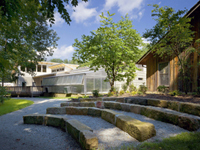 Finally, we are proud to announce that the Powdermill Nature Reserve in Rector, PA has been certified LEED Gold.